Yet again, summer is flying by. Hopefully, you’ve been able to spend some time relaxing and enjoying this incredible Colorado weather. 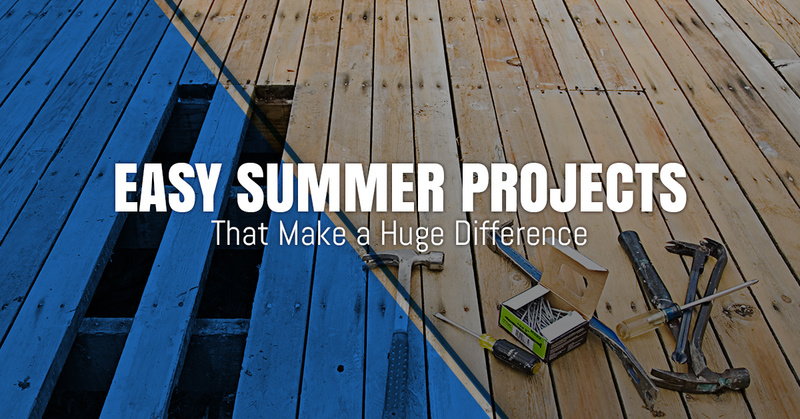 But these warmer months also present a great opportunity to tackle those home improvement projects that you’ve been putting off since winter. In this blog post, we’ll list five easy summer projects that give your home a much-needed refresh. Paint – What better way to make your home’s exterior more attractive than with a fresh coat of paint? But don’t look at paint as simply a visual improvement. It’s also a protective skin against UV light and moisture. If you could use some help with your painting project, check out the painting services we offer at MC Home Services. Matt, our home remodeler, can perform complete interior painting refinishing/restoration, spraying, faux and decorative, solid color painting, paint repairs, texturing, and more. Deck maintenance – Have you avoided having people over because your deck doesn’t look up to par? Then it might be time to seal, stain, or paint it. Keep in mind that staining or painting your wood deck will make it look brand new. Should you choose to keep putting off deck maintenance, you’ll likely need to replace it altogether at a much higher cost. Matt can help you and your family get back to enjoying the deck! Imagine how nice it would be to host several summer gatherings and receive compliments regarding your revamped deck. Clean gutters – It’s recommended to clean gutters once or twice a year, depending on how quickly they fill with leaves and debris. You’ll also want to check for leaks and breaks while cleaning. If you don’t feel comfortable with your current ladder or are just physically unable to get up on the roof anymore, MC Home Services can help. Check out the dryer vent – As explained by MoneyTalksNews, this task should be performed for fire prevention. We tend to forget that dryer lint builds up inside the machine and duct. You will want to remove the lint filter and use a long-handled vent brush to clean as much of the cavity as possible. Without messing with the vent attachment or gas line, try cleaning behind the machine as well. Then use a rag to reach into the vent and remove all the lint you can reach. Insulate water pipes – You can enjoy some decent savings by simply insulating your water pipes. Note that uninsulated pipes carrying hot water through a cold basement/crawl space waste heat. Consider insulating with pre-slit, hollow-core, flexible sleeves that are made of polyethylene foam. For decades, MC Home Services has been providing all-encompassing home improvement for those in Northern Colorado. Our team excels in many areas, from bathroom/kitchen remodels and renovations to basement remodels and carpentry work. What exactly sets Matt apart from other home remodelers in Colorado? Well, he brings a mentality that’s disciplined, conscientious, responsible, practical, and cohesive to every project. Don’t let another summer go by with that long to-do list still intact. Instead, think of how you’ll feel when those home upgrades have been completed. Call us today for a free estimate.